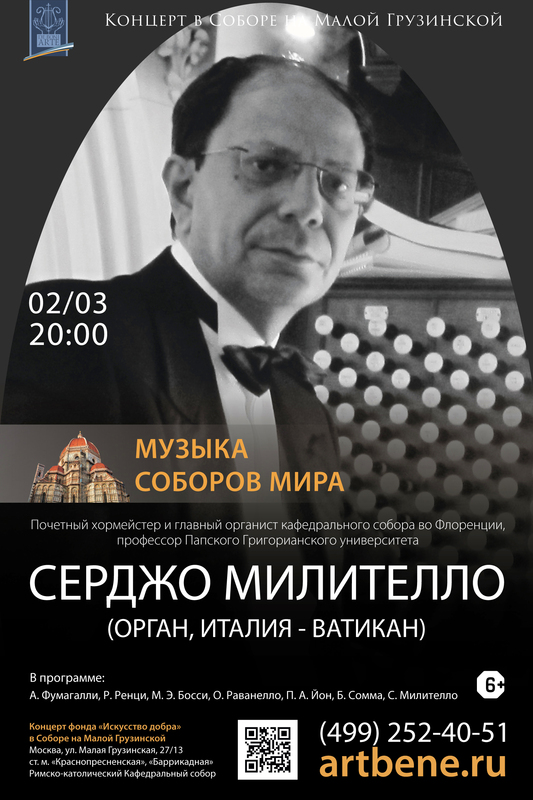 This recital gives us a rare opportunity to get acquainted with the Italian organ culture of the 19th and 20th centuries, absolutely unknown in Russia and capable of offering the audience a lot of unexpected aesthetic pleasure. The music is melodious and in many aspects close to the Russian mentality. The compositions of his compatriots are presented by Sergio Militello, an Italian organist at the Vatican. SERGIO MILITELLO (born 1968), is one of the most fascinating Italian musicians and one of the international concert organists for his musicianship and interpretative ability. He is a composer, choir conductor, concert performer (organ, piano and harpsichord) and teacher of master classes. As a soloist he has concertized in several countries throughout EUROPE (Italy, Switzerland, Germany, Czech Republic, France, Poland, Austria, Great Britain, Luxembourg, Belgium, Vatican City), AUSTRALIA (Queensland), USA (District of Columbia, New York, New Jersey, Pennsylvania, Maryland, Massachusetts, Rhode Island, Colorado, Arizona, Florida, California, Minnesota), CANADA (Québec, Ontario), SOUTH AMERICA (Argentina, Chile, Perù, Brasil), ASIA (China, Taiwan). As a world-class musician performing and brilliant organist, Sergio Militello combines the characteristic sound world of the organ with his own performance style. He has a distinctive repertoire that gives the public a chance to have a unique cultural experience. Sergio Militello’s concerts are marked by highly attractive repertoire carefully chosen for each venue and instrument. His performances are warmly received for their artistic quality, repertory, color of the sound, and his ability in the «Art of improvisation», with which he customarily finishes his concerts; technique that distinguishes him and places him in the great international tradition: he has become one the leading organist improvisers in the world, in fact he shows virtuosity, musicality, lyrical performance, total mastery. His performances are also a visual spectacle experience. Mr Militello’s programs have often been praised for their variety and interest, as well as for the artistic and communicative integrity he brings to the music of the “king of instruments”, incorporating music of all periods and styles into his programs. He has played also prestigious instruments that are known for their historical or stylistic importance and the greatest organs in the world (Pontifical Basilicas – Washington National Cathedral – Mariacka Basylica in Krakow – Cadet Chapel West Point, Cathedral of Salzburg, Hong Kong Cultural Center, Taiwan National Concert Hall, Bruxelles Cathedral, St Patrick’s Cathedral New York City, etc). He has written various compositions: liturgical songs, organ music, motets for the choir, hymns, music for soloist instrumentalists and organ, pieces for solo singers & chamber orchestras, chamber music. In 2002 he founded the «International Center of Sacred Music». In 2003 Sergio Militello received a special award by the Holy Father S.S. John Paul II. From 2003 to 2012 Sergio Militello was Director of the «Diocesan Institute of Sacred Music» of the Florence Archdiocese (Italy). Sergio Militello has been also Choirmaster & Principal Organist of the great Cathedral “Santa Maria del Fiore” in Florence. In 2012 he opened the “YEAR OF FAITH” with a special organ concert in the Cathedral of Buenos Aires (Argentina), metropolitan seat of Cardinal J.M.Bergoglio, the future Pope FRANCIS. In March 2013 he received a Resolution from the Senate of the State of Rhode Island (USA). 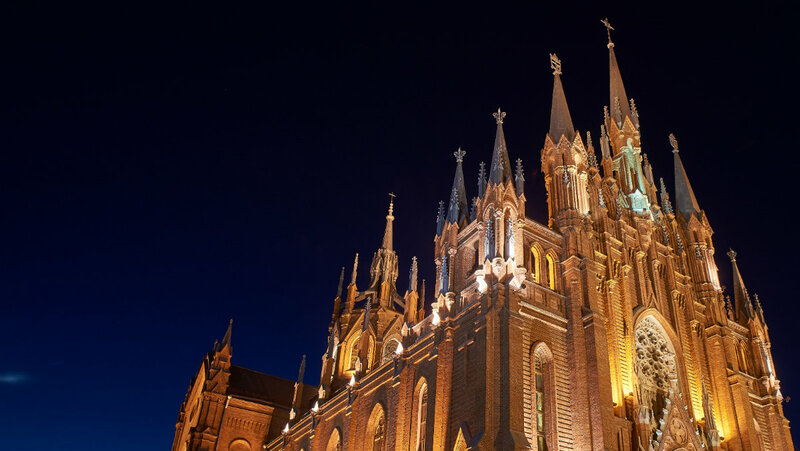 In 2015 he has inaugurated the Restauration of Pipe Organ at Matriz Basilica in APARECIDA (Brasil). Currently he devoted himself to composition, concerts (as soloist and as conductor) around the world, conferences, masterclasses, and teaching at important universities (“Pontifical Gregoriana University” in Rome, etc.). He is also Organist at daily Masses of the Holy Father in Vatican.